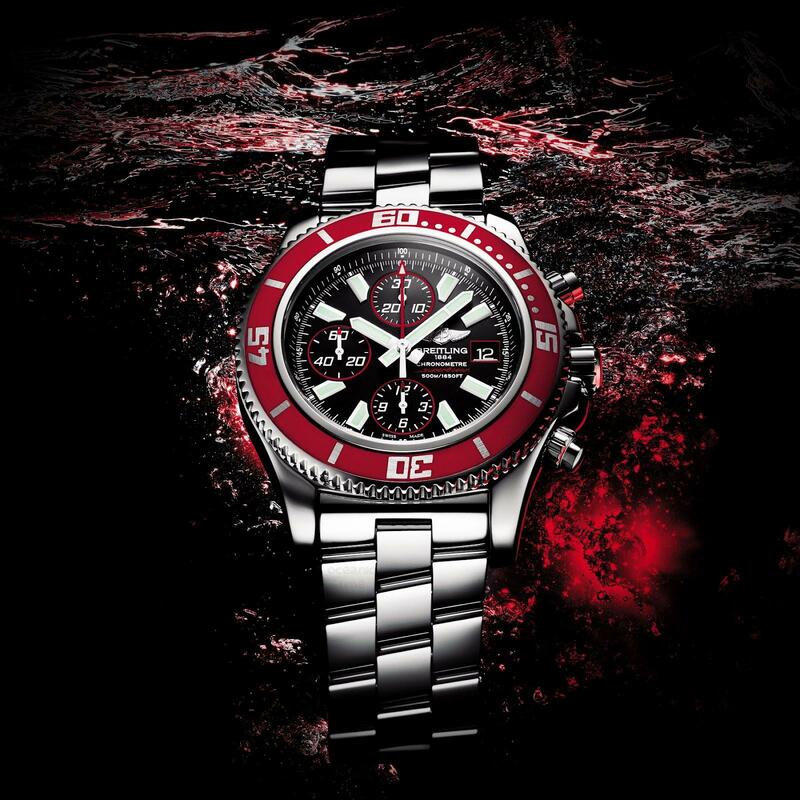 Water-resistant to a remarkable 500m, Breitling now introduces the Superocean II in a limited edition in a stylish ‘abyss’ red colour. The star of the show is the unidirectional rotating bezel, clad in red rubber on the chronograph sweep seconds hand, the counter rings, the date window and the model’s signature. The Superocean chronograph is limited to just 2000 pieces, this super-diver with a high performance self-winding movement chronometer-certified by the COSC (Swiss Official Chronometer Testing Institute). The easy to read dial is fitted with oversized hands and hour-markers, underscored by a luminescent coating, as well as a thick sapphire crystal that is glareproofed on both sides. 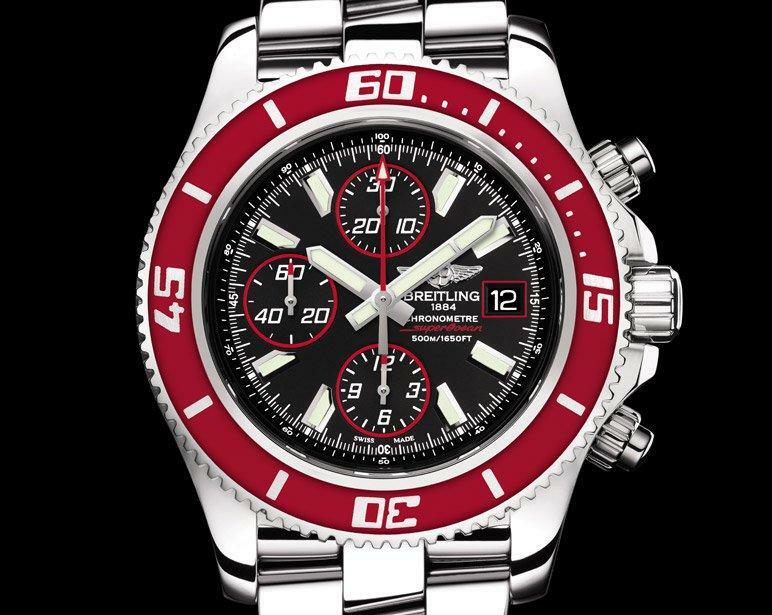 The Superocean Chronograph II is equipped with a screw locked crown and push-pieces that can only be activated after being unlocked, as well as a valve serving to balance out differences in pressure inside and outside the case. The watch comes on a choice of steel bracelet, a strap in rubber or Barenia leather, or the all new Superocean leather strap with Abyss red edges to match its bezel. Movement: Breitling Calibre 13, officially chronometer-certified by the COSC, self-winding, high frequency (28,800 vibrations per hour), 25 jewels. 1/4th second chronograph, 30 minute and 12 hour totalisers. Calendar. Case: steel. Water resistantto500m(1,650ft/50bars). Screw locked crown and pushpieces. Unidirectional ratcheted rotating bezel. Cambered sapphire crystal, glareproofed on both sides. Diameter: 44 mm. Straps: Barenia leather, Superocean leather, rubber Ocean Racer (perforated), rubber Diver Pro (with raised central ridge)/Professional.